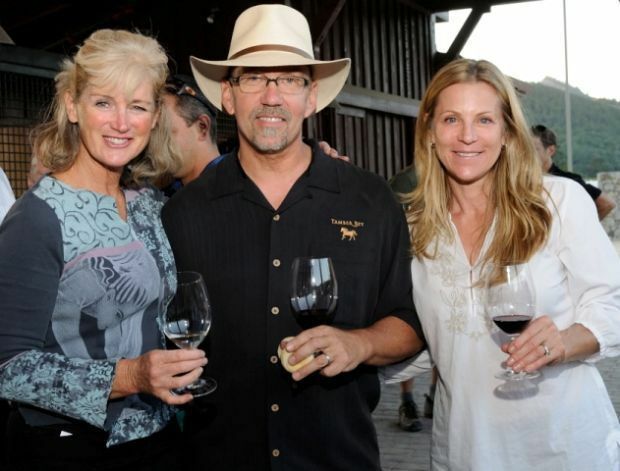 Heidi Barrett, left, with Barry and Jennifer Waitte, owners of Calistoga’s Tamber Bey Vineyards and Sundance Ranch, at an open house in 2013. Tamber Bey is the site of a gala benefit dinner on Friday, April 26 as part of the Clif CampoVelo Napa Valley celebration. Individual event tickets are available for a Friday, April 26 benefit dinner at Calistoga’s Tamber Bey Winery that is part of the third annual CLIF CampoVelo Napa Valley. Join chef and Top Chef Masters winner Chris Cosentino along with Miyoko Schinner, CEO and founder of Miyoko’s Kitchen, Clif Family Executive Chef John McConnell, Top Chef Bryan Voltaggio, Chef Jeff Mahin and Chef Travis Flood to celebrate the billion meals No Kid Hungry has provided to children in the United States. The multi-course meal will be complemented by wines from Tamber Bey and Clif Family as well as beers from Origin Beer producer, Nile Zacherle of Mad Fritz. Special guests in attendance include television commentator and cyclist Bob Roll, and Clif Bar and Clif Family Winery founders Gary Erickson and Kit Crawford. Proceeds benefit No Kid Hungry, a campaign for national anti-hunger organization Share Our Strength. One in five children will face hunger this year, statistics show. No Kid Hungry is working to end childhood hunger by ensuring that kids start the day with a nutritious breakfast and families learn the skills they need to shop and cook on a budget. Since 2017, CampoVelo has raised more than $35,000 for Chefs Cycle, a fundraising arm of No Kid Hungry, helping connect children in the United States to more than 250,000 meals. Reservations for the Gala Dinner are available at $225 per person and limited to 80 guests. For more information and the weekend itinerary, visit campo velo.com.